We value the trust that you place in us by sharing your personal data with us. MIDIPIANIST.COM takes your privacy seriously and is committed to handling your personal data in a way that is fair and worthy of that trust. MIDIPIANIST.COM will take all reasonable steps to protect your information from misuse and keep it secure. 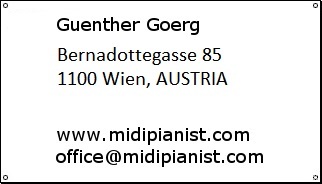 MIDIPIANIST.COM is an individual enterprise based in Austria. We create music that helps people relax, meditate and sleep with ease. The information we collect about you when you buy our products, make donations or use our Services may include the following (jointly referred to as: ‘personal data’). Your contact details. Your name, postal address and other contact details, such as your telephone number and e-mail address and other electronic identification data (such as IDFA, GAID, IP address, MAC address) and information regarding your use of our online Services. This may include data regarding the pages you visit. Your purchases in our online stores. The data we collect if you purchase a product, donate for a product or use a Service in one of our online stores, such as the amount and date of your purchase, the product you purchase or Service you use, location of the store, the website or app through which you make your purchase, payment method, payment status, discount, delivery method and delivery address. Your communication data. Your requests, any complaints you may have and any other data that we receive if we communicate with you via e-mail, online or via social media. MIDIPIANIST.COM collects and uses your personal data for the purposes set out below. Please be informed that insofar MIDIPIANIST.COM already holds information about you, MIDIPIANIST.COM may use that information for the same purposes. In order to manage and handle your purchases, donations and to provide you with the Services you requested from us, including handling your requests, we use your contact details, information regarding your purchases/donations in our online stores and your communication data. We will use your contact details to send you newsletters or general marketing materials as well as surveys about Products and Services you have purchased. At any time, you may opt out of receiving such marketing materials by following the instructions in any communication you receive from us. We will use the personal data referred to above in the section 'Personal Data We Collect' in order to improve our products and Services as well as to understand our customers both on an aggregated and on an individual basis. Creating such personal profiles of our customers, also enables us to send you marketing materials that directly relate to your use of our products and Services, if you have chosen to receive such materials. Also, depending on the choices you have made regarding your settings on various social media sites, certain personal data may be shared with MIDIPIANIST.COM about your online activities and social media profiles (e.g. interests, user name, photo, comments and content you have posted/shared etc.). If you are at least 13 but under 16 years of age, please get the consent of your parent or legal guardian before you give us any personal data about yourself. Your parent or guardian should contact MIDIPIANIST.COM for using your personal data and provide us with their name, e-mail address and any other identifying information that we may request. MIDIPIANIST.COM needs this information in order to verify that they have provided the necessary consent. We may follow up by phone or other means in some circumstances. If you are at least 13 but under 16 years of age, do not contact us or provide us with any personal data until after your parent or guardian has sent us an e-mail consenting to your contact and provision of such information. MIDIPIANIST.COM will take reasonable steps to ensure that your personal data are properly secured using appropriate technical, physical, and organizational measures, so that they are protected against unauthorised or unlawful use, alteration, unauthorised access or disclosure, accidental or wrongful destruction, and loss. Your personal data will be retained for as long as required for the above purposes or in so far as such is necessary for compliance with statutory obligations and for solving any disputes. MIDIPIANIST.COM retains your personal data for as long as required to satisfy the purpose for which they were collected and used (for example, for the time necessary for us to send you the newsletters you subscribed to, to provide you with customer service, answer queries or resolve technical problems, etc. ), unless a longer period is necessary for our legal obligations or to defend a legal claim. You may revoke your consent for receiving marketing communications at any time, free of charge by following the instructions in any marketing communication or by sending us an email. MIDIPIANIST.COM will then stop sending you marketing communications. Our websites and mobile applications contain links to third-party websites; if you follow these links, you will exit our websites. While these third-party websites are selected with care, MIDIPIANIST.COM cannot accept liability for the use of your personal data by these organizations. For more information, please consult the privacy statement of the website you are visiting (if such a statement is provided).